(Nanowerk News) Physicists have painted an in-depth portrait of charge ordering—an electron self-organization regime in high-temperature superconductors that may be intrinsically intertwined with superconductivity itself. In two complementary studies – published in Nature Materials ("Symmetry of charge order in cuprates") last week and Science ("Broken translational and rotational symmetry via charge stripe order in underdoped YBa2Cu3O6+y") in March – University of British Columbia researchers confirm that charge ordering forms a predominantly one dimensional ‘d-wave pattern’. 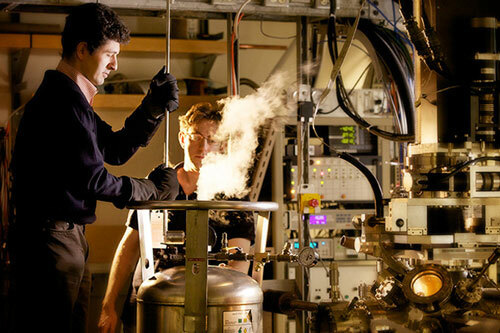 University of British Columbia physicists Andrea Damascelli, left, and Giorgio Levy, working with liquid helium. “Everything we can learn about the structure of charge ordering gets us a step closer to understanding how it’s intertwined with, and potentially competes with, superconductivity,” says Riccardo Comin, lead author of both papers who conducted the research while a PhD student at UBC. Comin is now a post-doctoral fellow at the University of Toronto. Charge ordering creates instabilities in cuprate superconductors at temperatures warmer than -100 degrees Celsius. It causes some electrons to reorganize into new periodic static patterns that compete with superconductivity. The reason behind this competition has remained elusive until these studies demonstrated that charge ordering and superconductivity share the same underlying symmetry. In March’s Science paper, Comin, Damascelli and colleagues investigated cold samples of yttrium barium copper oxide using x-rays and discovered that charge ordering produces a striped pattern, meaning the electrons self-organize along one direction rather than in two directions. The two studies were possible thanks to the longstanding collaboration between UBC and the REIXS beamline at the Canadian Light Source, where all the x-ray experiments were performed.